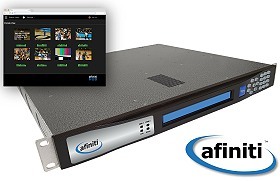 Adtec launches afiniti broadcast video encoders at BVE. February 2018, Nashville, Tennessee: Adtec Digital, a leading manufacturer of contribution video encoders and receivers, has announced the release of its afiniti line of dense encoder products designed for use in contribution broadcast applications. Adtec’s afiniti encoders will be showcased at the Broadcast Video Expo (BVE) to be held February 27 through March 1 at the ExCeL London exhibitions and international convention center located in Custom House, London. Adtec’s afiniti line of encoders were designed to meet the needs of top tier broadcast networks who require a reliable single rack unit contribution quality video encoder that is capable of ingesting multiple feeds at the same time. The dense architecture offered by the afiniti will allow for the simultaneous encoding of up to eight video inputs into a multiplexed ASI or IP feed. The afiniti currently supports the encoding of video into 4K/UHD AVC streams with the option to add HEVC encoding capability in the near future. The afiniti will be shown at BVE by M&J Communications in stand F17. As a primary distributor and integration partner for Adtec, M&J has long provided contribution and distribution video delivery solutions via satellite and through managed IP services.